Originally from the New York City area, Ms. Carboni’s previous educational and professional endeavors have included a Bachelor’s Degree in International Relations and Philosophic Anthropology, Certification training as a Montessori Pre-School teacher, and a Master’s Degree from New York University in TESOL and studies in Cross-Cultural Education and the History of Education in America. She spent 12 years teaching English-as-a-Second-Language to adult refugees from Southeast Asia, Ethiopia and Haiti, and in 1980 was awarded membership in Phi Delta Kappa -- an honorary international fraternity of educators. After moving to Boston, she pursued a second Master’s Degree in Clinical Social Work from Boston College and was subsequently hired by McLean Hospital, a private psychiatric hospital affiliated with Massachusetts General Hospital and Harvard Medical School where she had trained as an intern. While on staff at McLean, Ms. Carboni worked in adult inpatient psychiatry and focused on trauma recovery, bipolar illness and chronic mental illness. She worked extensively with families and couples and was a supervisor of social work interns. She also sought out and completed a training program at the McLean Institute for Counseling in Addictions. In 1990, Ms. Carboni left McLean to pursue a Fellowship in Child and Adolescent Psychiatry at the newly-opened inpatient unit at Cambridge Hospital where she had the distinction of being the first Social Work Fellow. While there, she worked not only on the inpatient unit, but also in the psychiatric emergency room and at the outpatient child and adolescent clinic. During this time, Ms. Carboni opened a part-time psychotherapy practice and was completing her five-year, post-graduate training program in Bioenergetic Analysis at the MA Society for Bioenergetic Analysis. She attended several workshops and training sessions with Alexander Lowen, MD, the originator of Bioenergetic Analysis, and informally assisted him on numerous occasions. After her Fellowship, she left Cambridge Hospital to pursue full-time private practice, treating adults in individual and couples therapy, developing a specialty in Bioenergetic Analysis, and providing consultation to other therapists and bodywork practitioners. In 1993, Ms. Carboni was awarded the honorary status of Diplomate in Clinical Social Work by the National Association of Social Workers and was allowed to use the designation “DCSW”. In recent years, Ms. Carboni has pursued intensive training and specialization in Clinical Hypnosis, EMDR and Brainspotting. She completed a year-long advanced hypnosis externship program with Daniel Brown, PhD ; trained in medical hypnotherapy at Winchester Hospital with Ted Benton, MEd; completed training in Ericksonian Hypnosis in Phoenix, Arizona; and for several years attended Master Classes in NYC with Jeffrey Zeig, PhD in Ericksonian Hypnosis. Trained in Level I and II of EMDR through the EMDR Institute, Ms Carboni pursued professional supervision with Deborah Korn, PhD in Cambridge, MA. And, in 2007, she was part of a charter training group in Advanced Level II Brainspotting with David Grand, PhD, renowned for his EMDR work and as the originator of Brainspotting. 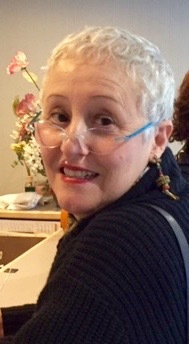 Editor of the Newsletter for the MA Association of Body-Oriented Psychotherapists and Counseling Bodyworkers. Now, after 30 years of practice, Ms. Carboni continues to believe in each individual’s capacity for growth, change and self-actualization. Her high professional standards, her intelligence, and her compassion are evident to all who know her.